After twelve years of marriage, two nights of peace and quiet sans kids far outweighs the attraction of a dirty weekend. 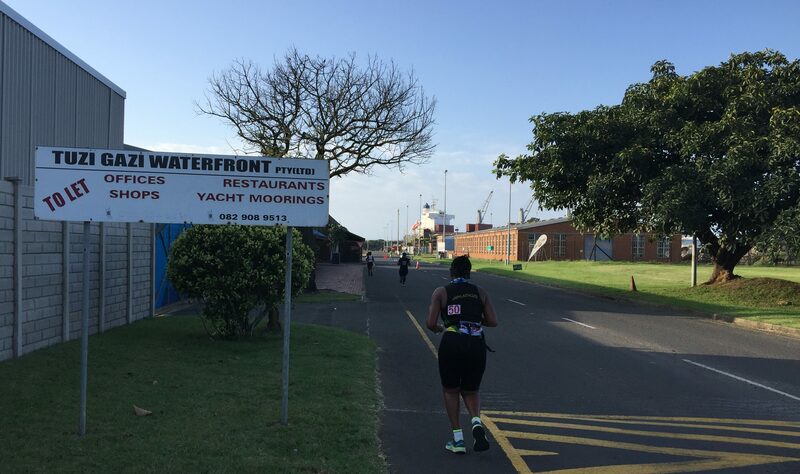 However, one thing is for sure – if you want to get hot and sweaty, Richards Bay is the perfect place to do it. 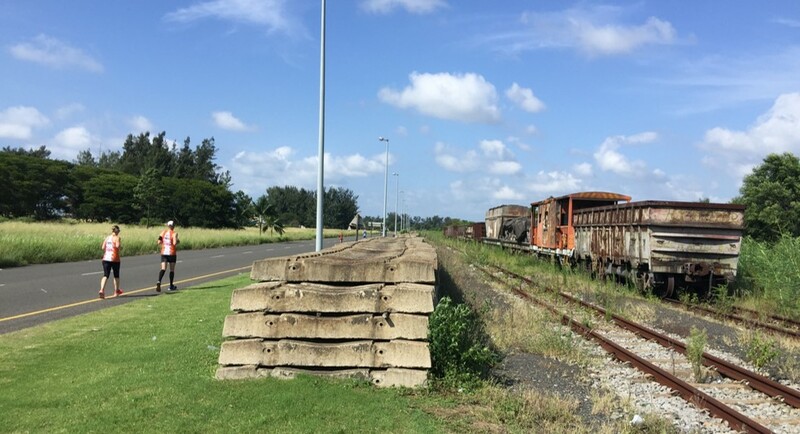 Richards Bay is a place where your washing never dries – despite the heat, it just achieves varying levels of dampness depending on the humidity levels. 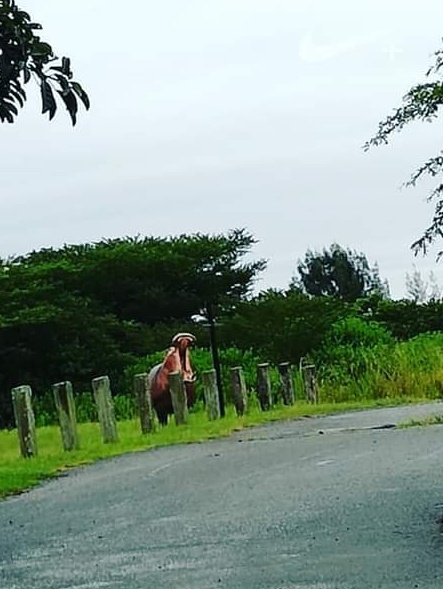 It is a place where shops stock jackets as novelty items, drinking red wine at room temperature will cause scolding if spilt and, according to the locals, Richards Bay is where the devil chooses to spend his winter holidays. 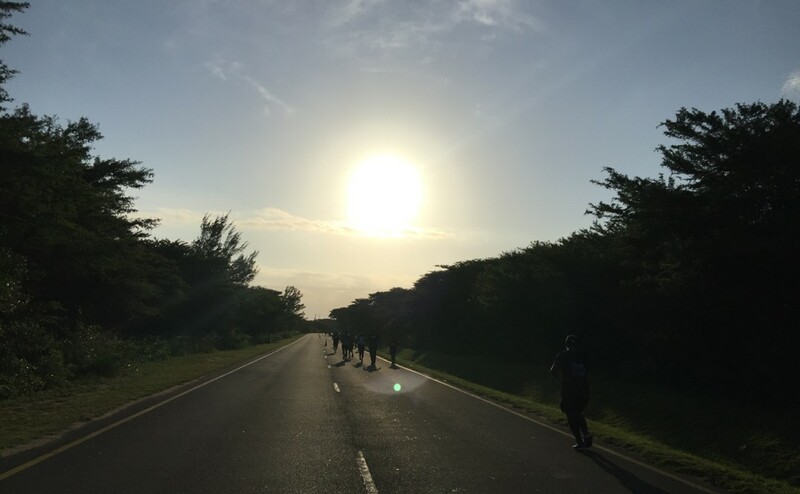 After several barren, marathonless years in the town, the Zululand Multi Sport Club recognised the need for a local marathon to help their athletes qualify for Two Oceans and Comrades. When thinking of a name for the race they looked no further than their resident spinster, Big Bertha – who happens to be a hippopotamus (and a massive one at that). Big Bertha spends of a lot of her time in the waters around the club house and often makes cameo appearances on long club runs. Bertha gave the race her personal nod of approval, making a cameo appearance on the route during the helper’s run the weekend before the marathon (photo supplied). In an effort to counter the hot and humid conditions, the race has one of the earliest starts on the calendar: 5am. The race is definitely servicing a local need and I was surprised at the size of the crowd gathered at the start. 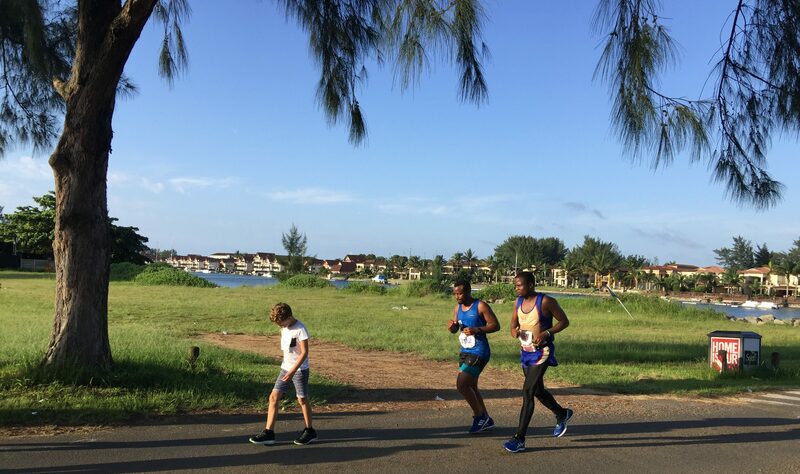 The organisers had an original target of 250 runners across all distances but managed to triple this with over 750 runners across all distances (181, 229 and 354 for the marathon, half and 10km respectively). Marathon runners catching the 10km runners (this little guy looks like he would have liked the organiser to add a 5km option). Setting off before dawn at 26°C (79°F) in 80% humidity means one works up a sweat almost immediately. However, tables are spaced no further than 2.5km apart and provided a plentiful supply of water, Coke and snacks to ensure we replaced all the good stuff we were sweating out. 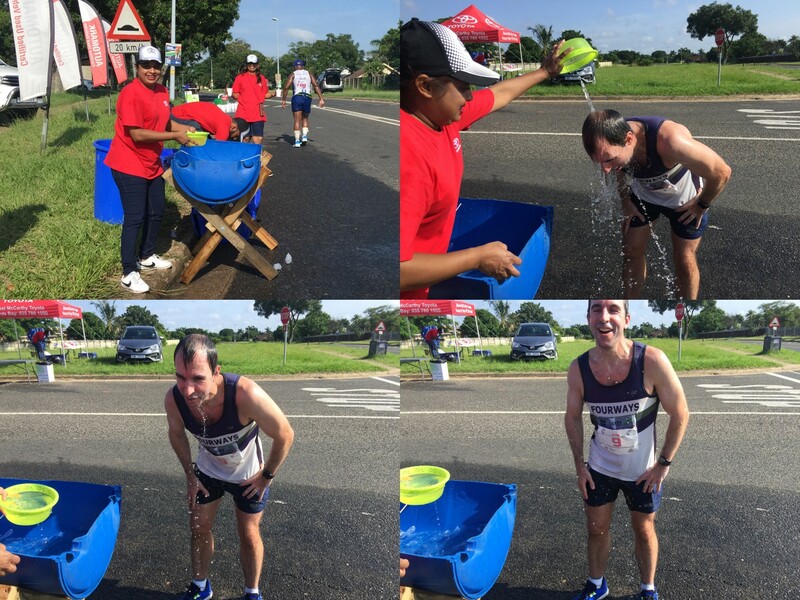 The BO’s table was my favourite of the race (I’m not sure if BO is a person, acronym or what you get if you don’t shower at least three times a day in Richards Bay). In most marathons I look forward to getting into the 30s (the measure being distance covered) but in this race one dreads the temperature getting into the 30°s (which it does shortly after sunrise). The sun makes an appearance and the temperature goes from ‘hot’ to ‘hotter’. I was told afterwards by race organiser Igna Freysen that we were lucky to get a “cool” day: her comments on the day’s weather, “Min 26 and Max 38. 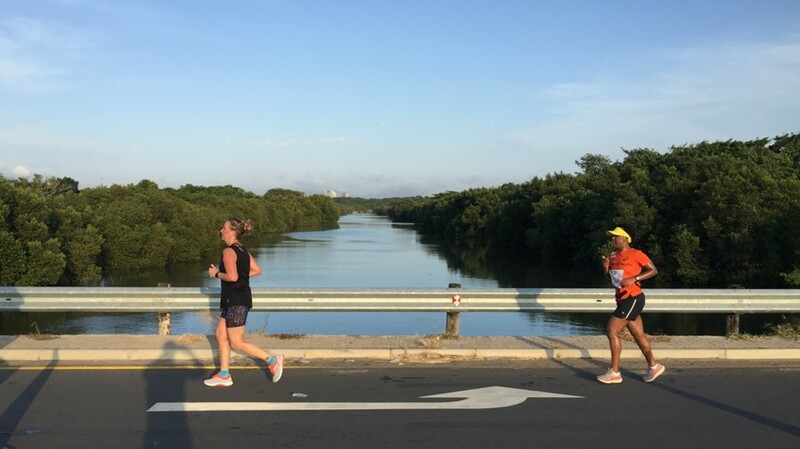 Humidity was at 82% (which, funny enough, is not THAT hot for locals as we train in this heat most of the time, but we did feel for the other athletes!)”. The race is a flat double-lapper with one steep hill, known as Strandlopertjie, right at the beginning and one gentle pull in the middle. 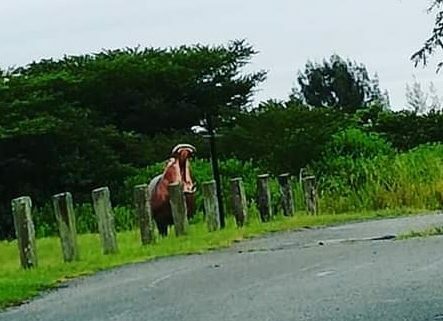 Strandlopertjie is often the most congested road in town since it is the only place local runners can do their hill training. There is just one hill in Richards Bay. The race starts in the lovely suburb of Meerensee (right next to Alkantstrand Beach), goes through Arboretum and then loops back via the new Port Gate. From there it’s a detour into the Small Craft Harbour (which includes the Tuzi Gazi waterfront with restaurants and lively night spots) before crossing the Iron Bridge (a local landmark) and heading back to the Zululand Multi Sports Club. 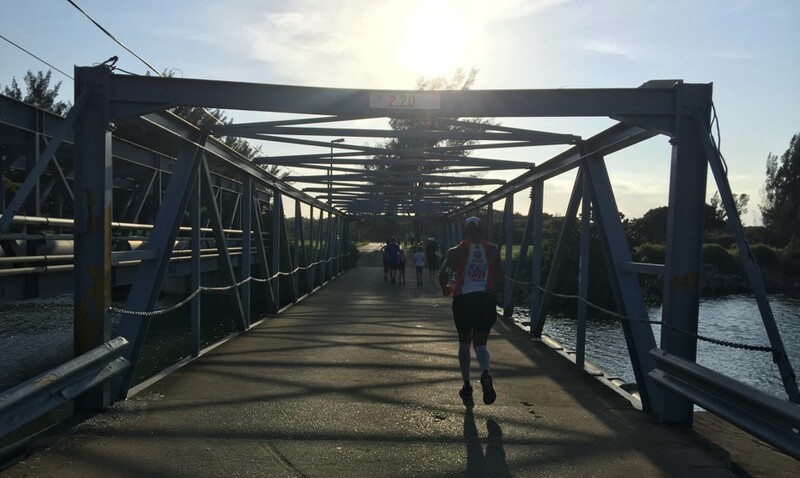 There are several marathons in coastal towns where you don’t get to see the sea and unfortunately this is one of them – but a stroll along the piers after your race is highly recommended. Concerns about traffic from the commercial and deep-sea fishing boat launches combined with the additional admin of policing out and back sections along the pier are the main reasons you avoid the ocean (but hopefully a seaside solution will be found in future years). Although you don’t get any sea views, there are plenty of water features along the route. The town is full of water features, many of which are tidal, and residents who don’t have access to a boat simply whip out their tackle and try their luck at the side of the road. Since it is too hot to do anything else except sit in the shade and drink beer, fishing is the most popular recreational activity in Richards Bay. Crossing the Iron Bridge – a local landmark and popular fishing spot. Angling in the scorching heat gives a new definition to the term ‘hotrod’ – and there were plenty of signs all around the town advertising an evening ‘hotrod’ race (I guess that’s how fishermen keep it reel!). The Hot Rods were out that evening but you needed to be on the streets 12-hours earlier to see the HotBods running the Hippo Marathon. 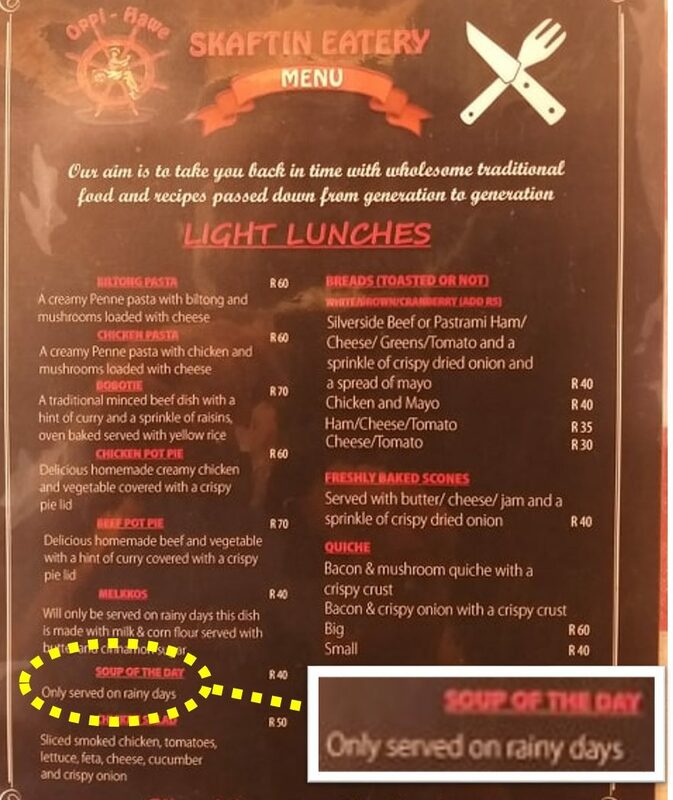 Clearly the community loves their souped-up cars, but getting soup in the local restaurants is much more difficult. We enjoyed several meals during our short stay at the Tuzi Gazi waterfront but the most memorable aspect was that the restaurants only serve certain meals like soup on“rainy days” – from this I take it that there are no cold days in Richards Bay but rainy days are “less hot than normal”. 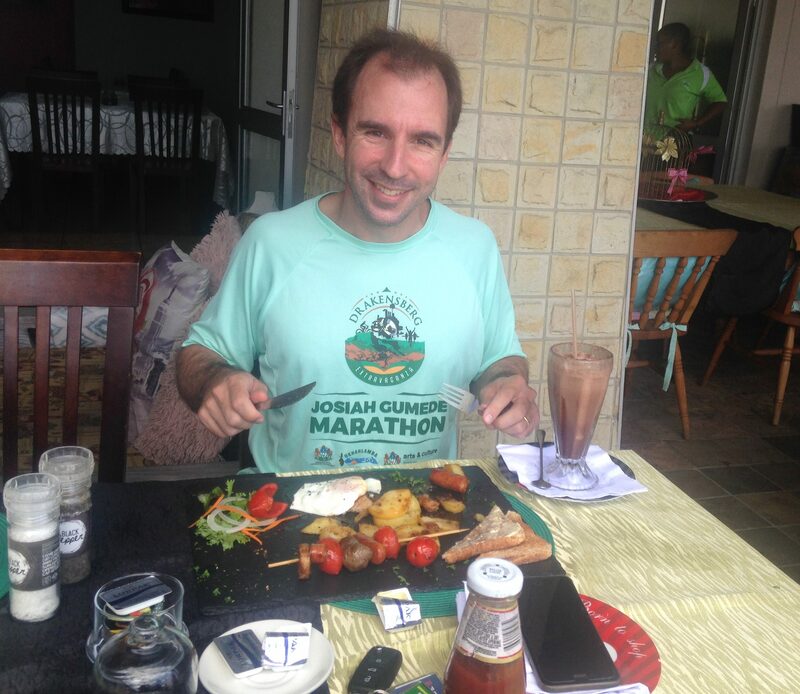 There are no cold days in Richards Bay but you can get soup on rainy days (thanks to Adri Mansvelder – who ran his debut marathon at Hippo – for the photo). The problem with 5am starts is that my stomach only wakes up at 6am – and by the time we hit we hit the Tuzi Gazi Waterfront towards the end of the first lap my stomach was wide awake. I was hoping this sign below said ‘Toilet’ and not ‘To Let’. Luckily my B&B was en route and I made it there before it was ‘Too late’! A problem with 5am starts is that my stomach only wakes up at 6am. My stomach was wide awake when we hit the waterfront. I was hoping this sign said ‘Toilet’ not ‘To Let’. Luckily my B&B was en route and I made it there before it was ‘Too late’! As the photos below illustrate, this is a lush, green part of the world that provides plenty of privacy for the runner with a pressing engagement. Plenty of places for the runner with a pressing engagement to get some privacy. Therefore, you may be wondering why I didn’t simply nip off the into the bushes. 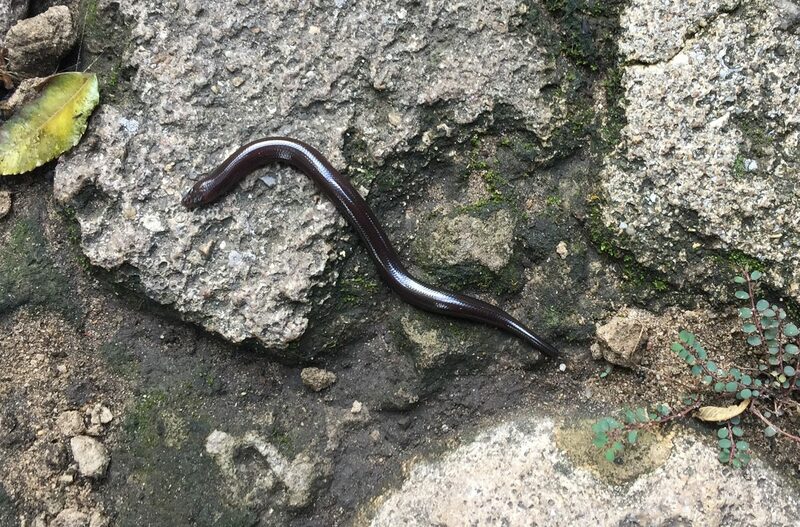 The answer is simple and scaly – this part of the world is snake central: there are black mambas, green mambas and brown house snakes lurking behind every nook and cranny. Colour classification apartheid is still rife in the reptile world and they do not take kindly to a land invasion from the white trouser snake. I don’t speak parseltongue and therefore couldn’t ask the snake what type it was. Instead I enlisted the help of snake rescuer Shaun Roberts. 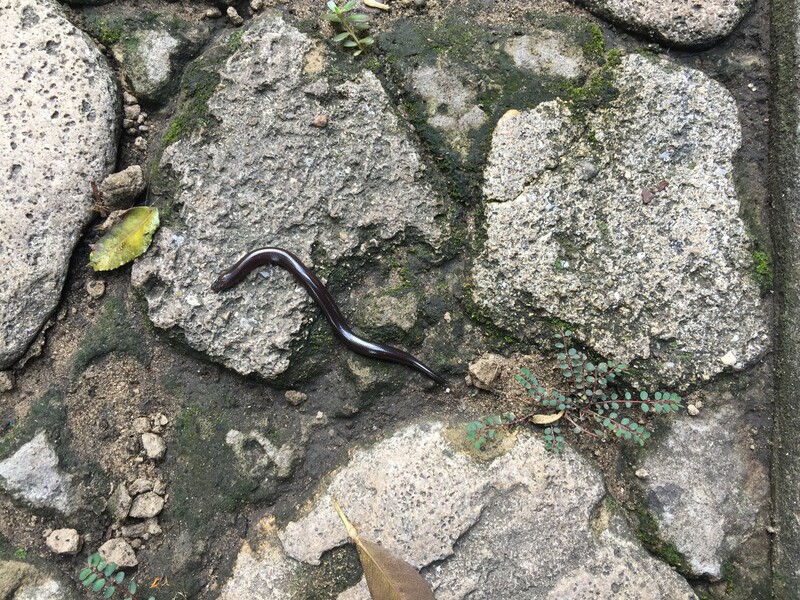 Shaun identified it as a gloss snake (which are seldom seen since they are burrowers). 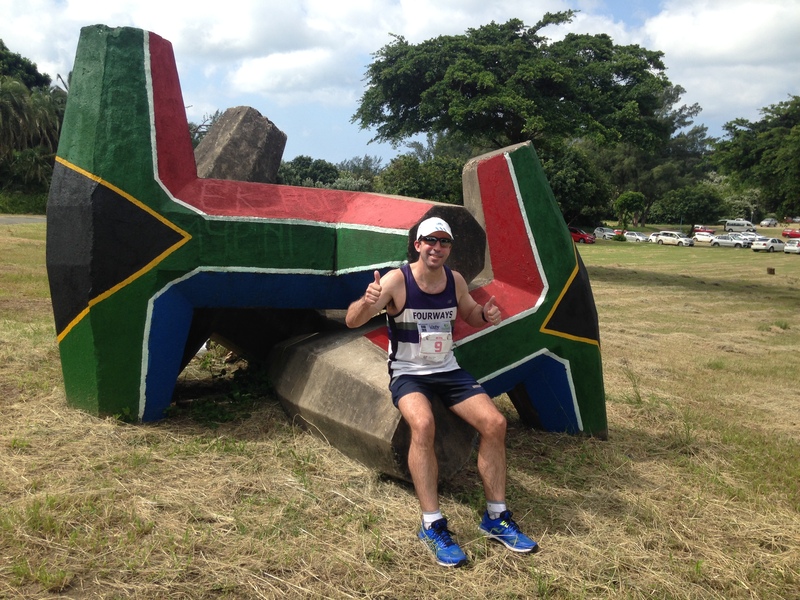 Double-lappers always provide a bit of a psychological challenge and I took a quick time-out for a patriotic breather on a dolos before starting the second lap. Dolosses were invented by a South African harbour draughtsman, Aubrey Kruger, in the 1960s to protect our shorelines from the erosive force of ocean waves. 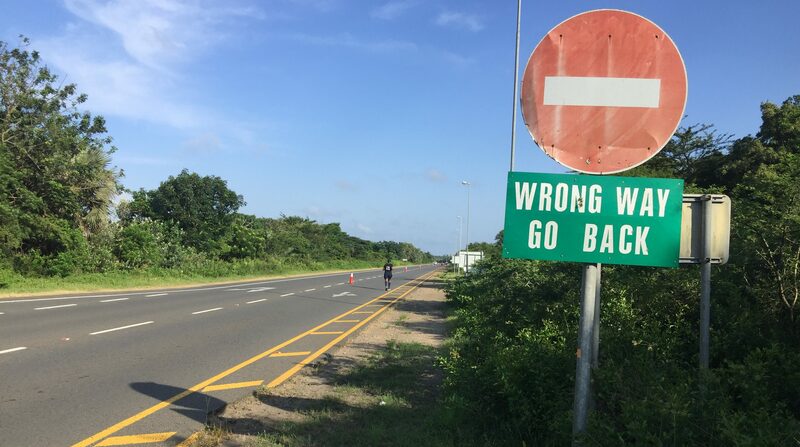 Having got my head around completing lap two in humidity worse than that found in a rickshaw-pullers jockstrap, one’s psychological state is not aided with this demotivational sign around 26km. Demotivational sign 26km into the marathon. You need every trick in the book to persevere through the Richards Bay heat. 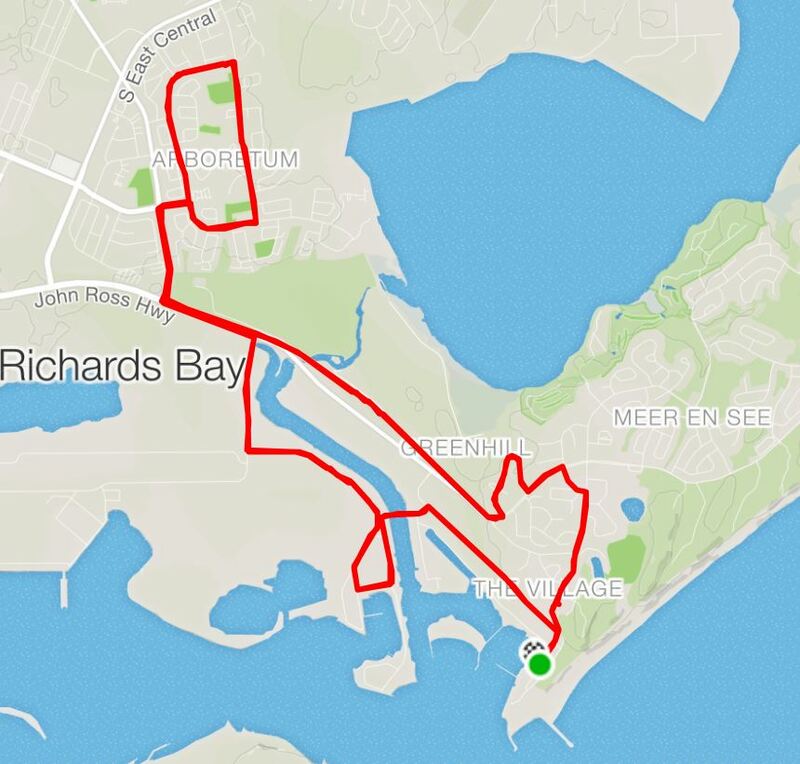 My favourite Jedi-mind trick is that I get fresh legs every ten kilometres – and I managed to shrug the sign off and reach the magical 30km mark for my last pair of fresh legs (the last two kilometres of a marathon don’t count, I see them as a ‘victory lap’ – and you always get extra energy for those). 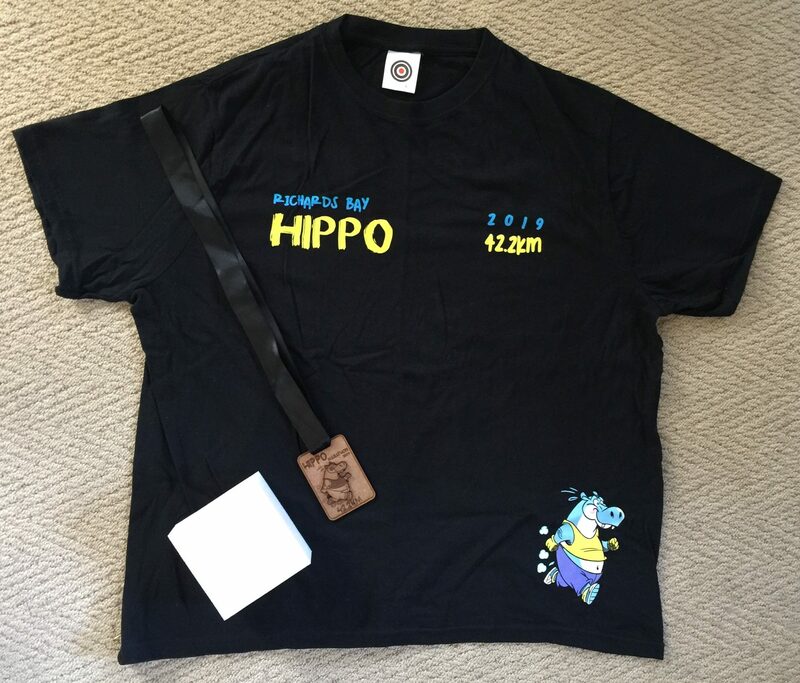 The shirt, medal and old-school sponge from the Hippo Marathon. Despite being a brand-new race, the Hippo goes old school with their cooling methods. Each runner was provided a sponge at registration and, although I didn’t actually see anyone running with a sponge, the water troughs at each table came heavily into play during the second lap. Over the second lap, the biggest risk is that your engine overheats. The Toyota table didn’t want me to end up like a burnt-out Ford Kuga on the side of the highway and I received a very refreshing ice-cold shower. Cooling my engine with an ice-cold shower. This cooled me down for a little while but, with the tropical Richards Bay sun hot enough to melt one’s eyeballs, I looked for added protection. With an eye for an eye, a nose👃 for a deal I spotted this sunglasses vendor and thought about doubling down with an extra pair. After negotiating the small craft harbour for the second time, I was looking forward to a large craft beer! One needs to careful where one enjoys one’s favourite beverage though since this sign on the approach to the beach warns that if you have a low tolerance for alcohol, the police will have zero tolerance for you. 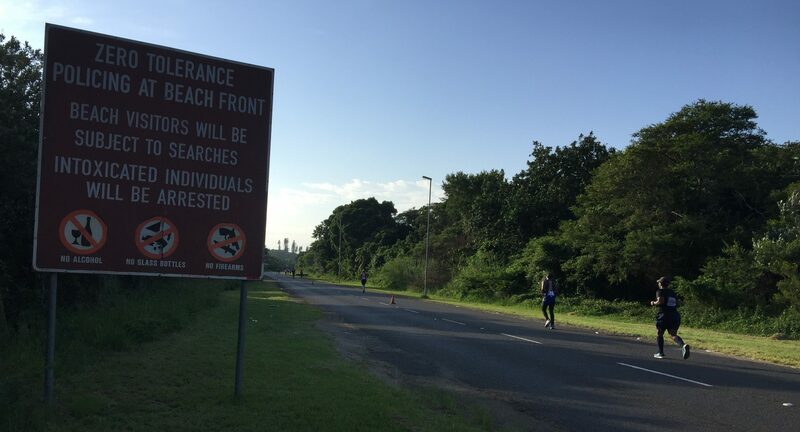 I was also intrigued that the “No firearms” graphic on the sign includes a picture of a knife – either knives shoot bullets in Richards Bay or the blades get so hot when they are left in the sun that they are classified as firearms. Zero tolerance for alcohol at the beach – the police are so strict they will even seize your winegums. One final piece of intrigue on the route was an abandoned train carriage. I thought that maybe a group of Transnet or Eskom executives were trying to flee the country from the Port of Richards Bay but ran out of coal just before reaching sanctuary at the harbour terminal. However, it turns out that it’s redundant equipment that is in the process of being cut up for scrap metal – they’ll have to be quick though to be beat the rust from the constant humidity. Nothing unusual to see stationary train carriages in South Africa. The race boasts a lovely relaxed finish venue at the Zululand Multi Sport club house complete with braai facilities, catering and a family friendly ‘Chill Zone’. And if you are an out of town runner, free camping sites are provided so you can literally roll-out of bed to the start and roll back in once you are finished. The club house also has the lovely backdrop of a tidal inlet – and that was where I headed (although with near 100% humidity the water doesn’t feel much different to the air). 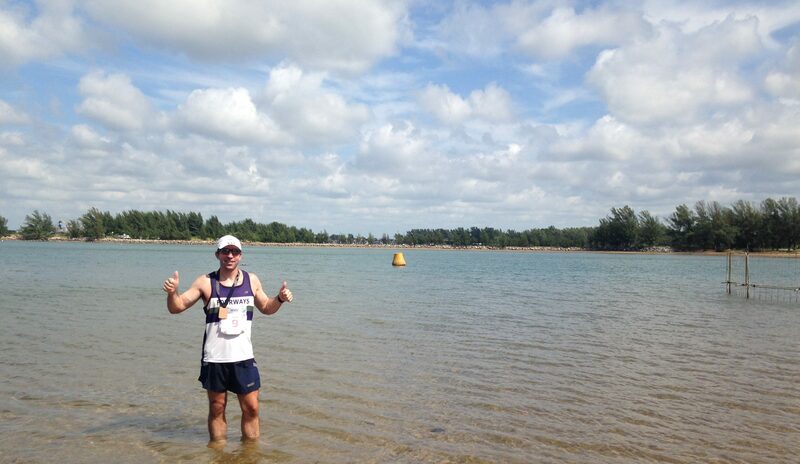 Chilling in the lagoon after the inaugural Hippo Marathon. The air here is almost as humid as the water. I make a point of running inaugural marathons because many of them tend to be one-offs but, like with classic literature, for those that endure it’s a good brag and say you ‘owned’ the first edition. However, I do approach inaugural races with a certain level of trepidation and expect there to be some teething problems (examples can be found here and here). Having said that, I am pleased to report that this race, put together by the goodwill (and donated time) of volunteers, was absolutely flawless – race director Casper Kriel and his team can be extremely proud of the event. This is even more impressive when you consider that the race has no title sponsor* and was 90% financed from the entry fees (R180, R120, R80 for the marathon, half and 10k). * Richard’s Bay Coal Terminal covered some of the prize money and the ‘Chill Zone’ at the end and Bell Equipment assisted with the race shirts. The Richards Bay Hippo Marathon is definitely a race to look out for in future years. The organisers put in the effort and want you to make a weekend of it. If you’re feeling hot and bothered, head to the Hippo Marathon – and get hot and sweaty instead. Signing out from the Richards Bay Hippo Marathon. We managed to pick the only unlicensed restaurant at the waterfront for brunch so I had to settle for a double-thick chocolate shake instead of my customary beer. Look out for the next report from the Surrender Hill Marathon in Clarens. Great! Thanks for being there, and a definite for all runners that battle to qualify for the Comrades. A tip for all coming inland, please acclimatize a bit and a one week stay along the coast from Richard Bay is advisable; temptation remains to moderate the alcohol intake to quench your thirst, beers go down pretty after a sweaty run. Keep an eye on the trail run at Mtunzini (2 days over the weekend); this is scheduled bit later during the year. 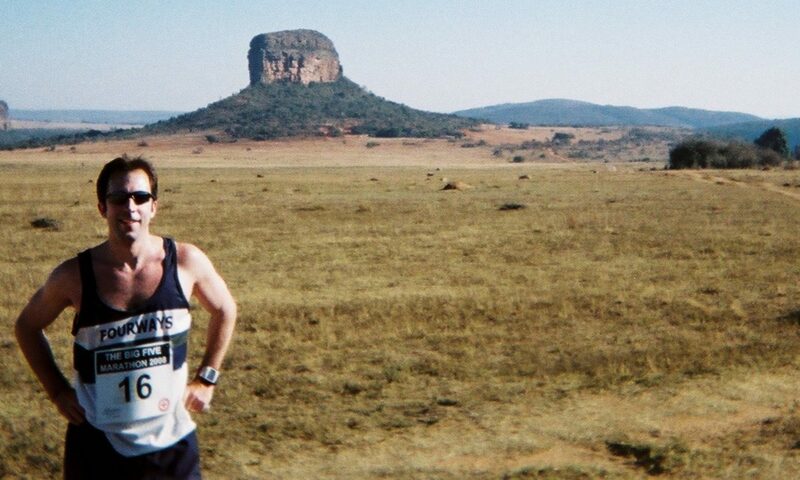 Tronox Marathon (Empangeni) is on the 31 March 2019 and worth a try with hills, bit of gravel and most tar roads. Pleasure – and thanks again for a great race. 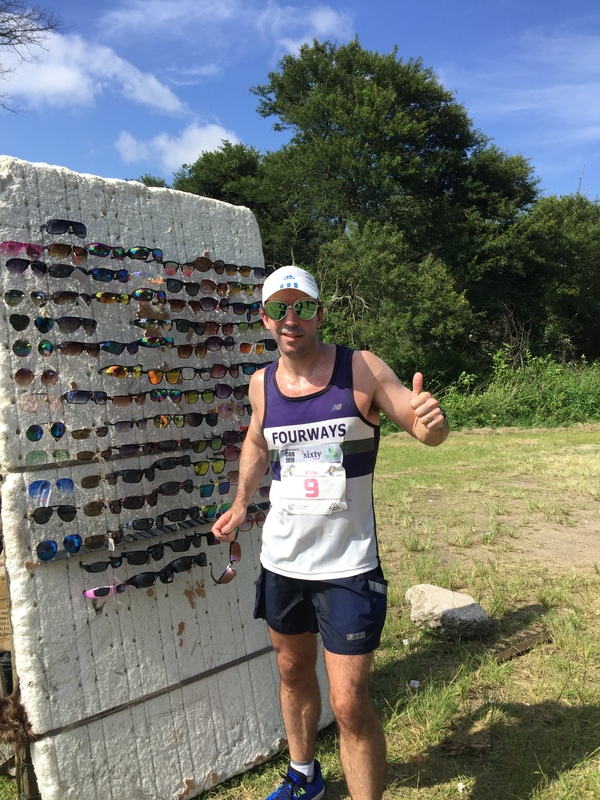 With many the ‘challenges’ facing the larger runs with lack of water, it’s great to take part in events where everything is perfectly organised. Your account of our little town was so pleasant to read! Its easy to forget the charm of a place once you’ve lived here for a while, so your recollection was a breath of fresh (humid 😉 ) air. Hope you’ll be back for future races as well!